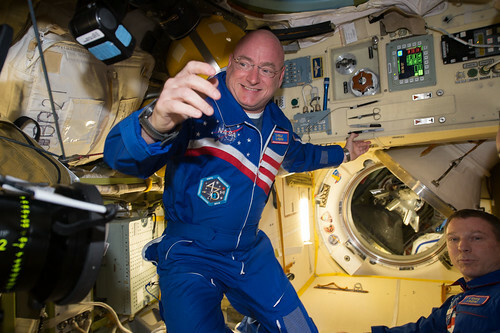 ISS043E059259 (03/28/2015) --- NASA astronaut Scott Kelly (left) is happy to be aboard the International Space Station after the hatch opening of the Soyuz spacecraft Mar. 28, 2015. Kelly traveled with Expedition 43 Russian cosmonauts Mikhail Kornienko and Gennady Padalka of the Russian Federal Space Agency (Roscosmos) on the Soyuz TMA-16M that launched Friday, March 27, 2015 from Baikonur, Kazakhstan. Kelly and Kornienko will spend a year in space and return to Earth on Soyuz TMA-18M in March 2016. Most expeditions to the space station last four to six months. By doubling the length of this mission, researchers hope to better understand how the human body reacts and adapts to long-duration spaceflight. This knowledge is critical as NASA looks toward human journeys deeper into the solar system, including to and from Mars.